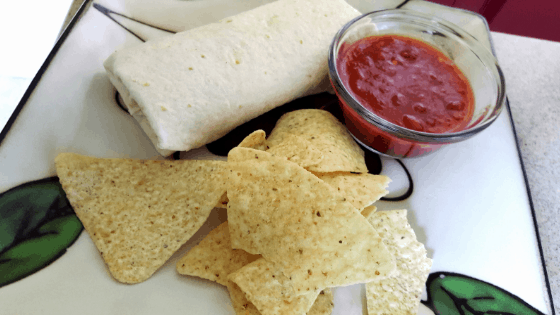 This Beef, Beans & Cheese Burritos recipe with homemade burrito mix is easy to make and absolutely delicious! A favorite in our family- even the picky eaters enjoy it. Combine cumin, chili powder, paprika, garlic powder, salt, and pepper for burrito mix. On medium heat, mix tomatoes & chilies, burrito mix, and refried beans. Stir frequently, reduce heat and cook for 10 minutes. Spread burrito filling onto burrito tortilla. Add 2 tablespoons of white cheese dip. Top with desired amount of sour cream. Roll into burrito. Eat burrito as is or heat skillet and fry burrito on each side for a crispier texture. Serve with your favorite Mexican side dish. We enjoy tortilla chips, cheese dip and salsa. Any leftover burritos can be stored in refrigerator or wrapped and frozen for future use. ⟵Low Price on Instant Pot at Kohl’s!